thankful for that trade. It worked because of my tools, patience, and discipline - but I was fighting my emotions. 6/29/2007 1:03:35 PM Mountain mm:: Al - if you still keep an eye on the Chat (I suspect) - Happy Anniversary, and have a nice camping trip. 6/29/2007 10:54:44 AM Mountain jrg:: Thank you for a most enjoyable day, Al !! Happy fourth to all! And Happy Anniversary, Sir! 6/29/2007 10:47:34 AM Mountain jrg:: Well, it is likely that you have forgotten more about trading this market than most of us will ever learn!! 6/29/2007 10:33:55 AM Mountain jrg:: Amazing! 6/29/2007 10:21:24 AM Mountain jrg:: I must be honest with you!! Watching you trade this difficult market is one of the most enjoyable events for me in years!! 6/29/2007 10:11:14 AM Mountain DCF:: are we in a wave 5 or 3 since the high? 6/29/2007 10:08:03 AM Mountain cgm:: dont u love that sun $ high? 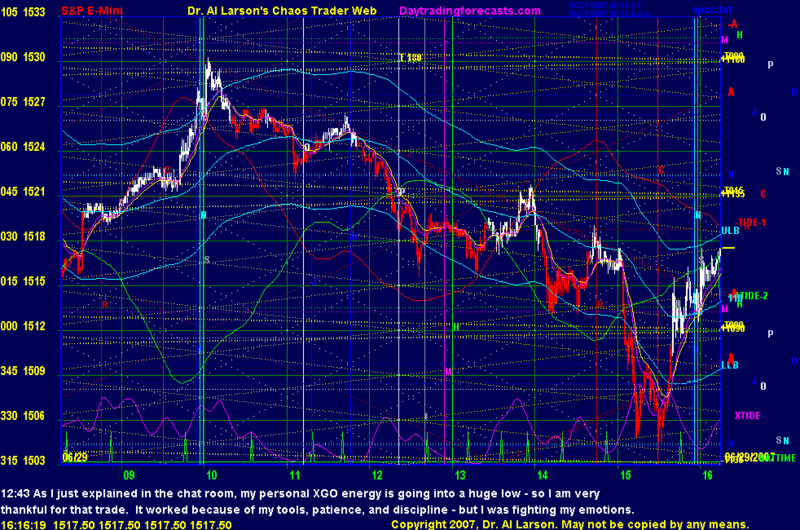 6/29/2007 9:13:37 AM Mountain jrg:: For over 3 hours, the market has exactly tracked the direction of your tide-1 line !!! 6/29/2007 8:37:38 AM Mountain jrg:: Is it just me, or is the market tracking your -tide-1 red line?? 6/29/2007 7:48:14 AM Mountain jrg:: OH, that's funny! A serious logistics problem!! 6/29/2007 7:17:19 AM Mountain jrg:: HK is very densely populated!! I did not realize how many China Army personnel fought AGAINST us in the Vietnam War > war was maybe us versus the Red Army!